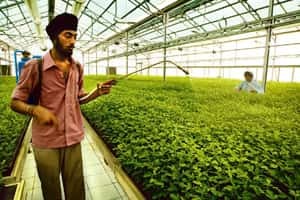 Mumbai: India’s largest state-owned fertlizer company by revenue Rashtriya Chemicals and Fertilizers Ltd (RCF) plans to enter the contract farming and greenhouse business by tapping its network of customers and using some part of its land holdings. The company plans to build a network of at least 1,000 farmers to grow flowers, fruits and vegetables. Some of this will happen at greenhouses RCF will set up on its own land. The state-owned firm will also help farmers sell their produce to local retailers or exporters. It will provide inputs on fertilizers and crop protection products to the farmers. “The company has already started a greenhouse in its Mumbai factory premises in a small way, and it will be spread to some other locations as well," this person said. The RCF plan is almost similar to a recent initiative in India of German crop protection and plant biotechnology firm Bayer CropScience AG. Named “Food Chain", the Bayer programme envisages enrolment of at least 1,000 farmers who cultivate around 20ha each, and who will receive training in new crop technologies, and hybrid seeds and crop protection products. Bayer CropScience, in turn, will then vouch for the quality of the crop. Bayer has also inked pacts with retail firms, such as RPG Group’s Spencer’s Retail Ltd, ITC Ltd and Aditya Birla Retail Ltd to procure the crops produced by these farmers. As part of its diversification into related areas, RCF also plans to develop up to 100 acres of land in Mumbai to set up the country’s first chemical commodity exchange, a hydrogen plant and a chemical industrial park involving an investment of more than Rs2,000 crore. The hydrogen plant is to be developed in a joint venture with a German multinational, according to a top RCF executive, who sought anonymity, while the industrial park can house about 50 chemical units. The chemical commodity exchange, and the agro-marketing project will also have strategic partners, said the same executive. RCF, which holds more than 800 acres of land in Trombay along the Eastern Express Highway in Mumbai, is expected to sign the joint venture agreement for the hydrogen plant soon. The company ended 2007-08 with revenues of Rs5,228.97 crore and a net profit of Rs158.15 crore.